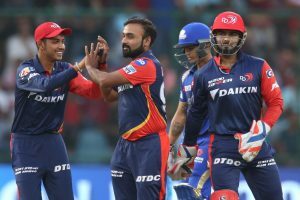 DELHI – Mumbai Indians were knocked out of the IPL on a dry pitch that turned legspinners Amit Mishra and Sandeep Lamichhane into absolute terrors. That meant Rajasthan Royals are favourites to make the playoffs, unless Kings XI Punjab beat Chennai Super Kings by at least 53 runs. Now that the necessary details are out of the way, time to enjoy some drama. It was a hopeless situation for Rohit Sharma and his men. They were asked to chase in conditions that became progressively difficult to bat. Then they gave up a par-plus total of 174. Later, they were tottering at 122 for 7. So Ben Cutting began hitting sixes. Mumbai needed 38 off 18 when he smashed Liam Plunkett for 4, 6 and 4. They needed 18 off six when he launched Harshal Patel into the crowd behind short fine leg. He was playing an innings to rival the blitz that won Sunrisers Hyderabad the title in 2016. He saw a short and wide offcutter. He knew it needed to go. He swung his big shoulders. He launched it in the air. The trajectory seemed to suggest it would soar over deep midwicket. It didn’t. And a team that was placed bottom of the table, that spent the evening veering from one extreme to the other, savoured pure joy. There was a limp show from the Delhi Daredevils top order and a breathtaking fifty from Rishabh Pant. There were three drops, and an overthrow for five runs, but Glenn Maxwell masterminded two ridiculous catches on the long-on boundary to dismiss Rohit and Kieron Pollard. Plunkett’s over cost a debilitating 15 runs. Boult followed it up by giving away only 5 in the 19th. Harshal seemed to lose the game one ball, and off next, had it wrapped up. Some teams might drop a player whose most recent scores are 5, 9, 2, 5, 6. Daredevils, however, made him open the batting. Now as much as that might sound funny, it made sense here. On a slow deck, the new ball presents the best opportunity to score. And Glenn Maxwell has the potential to break a rut with one shot. But he fell for 22 off 18 and finished with an average of 14.02 from 12 innings. To put that in context, among those who have batted at Nos. 1 to 6 a minimum of 10 times, only seven others have fared worse. Things weren’t going to plan at the other end either. The first delivery of the fourth over was steered to point and Prithvi Shaw thought there was a single, even though the ball was headed straight to the fielder. He saw Hardik Pandya grab it, set up for the throw, release it targeting his end and yet made no attempt to get back to his crease. He was run out for 12. He looks like he shouldn’t be scoring any runs, losing balance with every other big shot he plays. He literally fell on his backside attempting one tonight. But in between those awkward moments, there was unbelievable brilliance. Pant galloped to 24 off 11 on a pitch that really wasn’t suiting strokeplay. He was hitting one-handed sixes. He was reverse-scooping fast bowlers for four. He was making commentators run out of expletives. If only he could have convinced the umpires that he should bat at both ends. The 20-year old did the next best thing, though. After racing off the blocks, he slowed down to make sure he could bat through the innings. It was terrific game awareness in tough conditions. Pant was dismissed in the 17th over, for 64 off 44 deliveries, by which time he had become the top-scorer this season with a tally of 684. A break-up of his runs makes even better reading: 114 off 73 in the Powerplay (strike-rate 156), 403 off 253 (strike-rate 159) in the middle overs and 167 off 68 (strike-rate 245) in the death. Pollard had been dropped twice – on 0 by Shaw and 3 by Abhishek Sharma – when he muscled the ball to long-on. And it was preparing to go over the ropes. Maxwell raced to his right, leapt knowing his momentum would take him out of bounds. He took the catch with both hands, and while still in the air outside the boundary, he lobbed it over to Trent Boult who completed formalities. Four overs later, Rohit – his left shoulder badly injured in the field – tried to clear the ground. He was deceived by a slower ball from Harshal Patel but it still had enough timing to carry all the way. But Maxwell was there once again. And so was Boult to back him up. The Australian took the catch to dismiss Cutting as well. Each of them were match-winning moments.